"This is all I know how to do... prepare and inter the deceased." 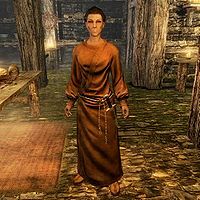 Alessandra is an Imperial priestess of Arkay, who is solely and bitterly responsible for tending to Riften's Hall of the Dead. She is quite uncomfortable about her line of work, due to some unfinished business in the past. During the related quest she will ask you to sort things out and give her inner peace. She spends all her time surrounded by the dead and never even leaves the hall. She wakes up at 7am and starts the day with a one-hour breakfast. She will then work for twelve hours, mostly tending to the body of a dead Nord on the table. At 7pm she takes a quick one-hour dinner, then proceeds to work until her bedtime at midnight. She wears a set of monk robes with a pair of boots. She wields a leveled dagger (up to elven quality at level 20) and carries a belted tunic and an assortment of lower-class items and gold. She knows several spells as well, specifically Frostbite, Ice Spike, Oakflesh, and Lesser Ward. When you enter her workplace, she makes it quite clear that she dislikes her job, saying, "Come to laugh at the grave tender?" and "I can see that disapproving look in your eye." If you speak to her and ask her about her work, she will explain the unfortunate situation: "If you're trying to ask if I tend the hall of the dead alone, then the answer is yes. You think anyone around here is going to lift a shovel to help me? Guess again. 'Leave the dirty work to old Alessandra.' Look, I didn't ask for this job, I got stuck with it thanks to my father." She will then elaborate why she blames her father: "My father was a Priest of Arkay. All my life was spent around the dead, being forced to learn the proper burial rituals and prayers. I never had any friends; who'd want to spend time with 'the little weird girl who hangs around dead people?' So I grew up with a miserable trade. This is all I know how to do... prepare and inter the deceased." She is obviously looking for help and will explain how: "I'd like to make the journey to the Hall of the Dead in Windhelm [sic] and give my ceremonial dagger to Andurs, the caretaker. I believe once it's interred with my father's remains I'll be at peace with his memory." You can choose to wish her the best of luck and she will say, "Yes. Perhaps one day I'll be able to make the journey, but for now I need to tend the dead." You can also choose to help her out, and she will explain, "I hadn't asked you because I was afraid you'd say no. I appreciate your help. Here, I'm entrusting you with the dagger. Bring it to Andurs and he'll take care of the rest." 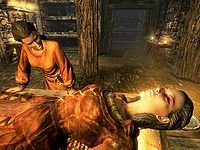 After handing you the dagger, she will explain its symbolic meaning with, "A Priest of Arkay is entrusted with a ceremonial dagger once they've completed their training. It [sic] usually given by the head priest who sanctified the ritual. In my case, the head priest happened to be my father. The thing is, I never wanted to follow in his footsteps... I [sic] some ways I still don't." She will then admit she was given little choice: "I had to for honor's sake, but I had waited too long. My father died before he could see my training to completion. When I finally became a priest, they gave me the new high priest's dagger, but I already owned my father's. So you see, I have to return it. It breaks tradition, and I need to tell him that I finally did what he wanted." She will send you on your way with, "Be cautious, the pilgrimage to the Shrine is not an easy one." In Whiterun, local Hall of the Dead priest Andurs definitely knows about Alessandra's problem. When you hand him the ceremonial dagger, he will be grateful: "She finally decided to return it to her father. Bless her heart. I will make sure this finds its way to his tomb as soon as possible. Thank you for bringing it, my child." When you return to Alessandra in Riften, she will immediately say, "The pilgrimage is complete, I can feel it." When you tell her the good news, she will admit, "I felt a caress on my cheek some time ago... I thought it to be a trick of the wind, but I think it was a message from my father. We've made peace with one another without even uttering a single word and I'm content for the first time in my life. I thank you. Here, please accept this as a token of my appreciation for your selfless action." She will then hand you a reward (see this section) and will start to greet you with, "I'm feeling much better thanks to your efforts." Pilgrimage: Help Alessandra make peace with her dead father. Alessandra says Andurs is in Windhelm, but he is actually in Whiterun. Esta página foi modificada pela última vez à(s) 00h29min de 28 de janeiro de 2016.